Owned by Bengaluru based ANI Technologies, Ola (www.Ola.com) is an efficient, customer centric online cab company in India and a leader in its segment. It has a network of more than 2 lakh cars across 100 cities. Its service can be availed by consumers through its mobile app. Founded in December 2010, Ola’s mission is to solve the personal transportation challenge for a billion Indians. Industry reports indicate that India added approximately 270 million new smartphone users, by the end of 2014. Smartphone proliferation has led to an astonishing increase in mobile-based browsing – and, of course, mobile search. In order to reach users and to acquire new users on the mobile, Ola reached out to Sokrati, a Google AdWords Premier SMB Partner in October 2014. The sole objective outlined was to increase the Ola app downloads on Android and iOS. Google AdWords emerged as the most effective way to promote the mobile app to frequent travellers in the age bracket of 20 to 50 years and across locations. To best meet campaign objectives, a focus on ‘Mobile app installs’ campaigns within Google AdWords was prioritized for driving awareness for the mobile app. Further users were directed to the Google Play Store or Apple App Store. By leveraging Display Network, Search and YouTube networks to simultaneously promote the app, the impact was amplified. Over 300,000 keywords across all possible search variations were listed and deployed in a short period of time to reach out to high intent users while they were searching for a taxi-hiring app, or exploring an activity such as travel, offsite trip, etc, that could be made easier with the Ola app. 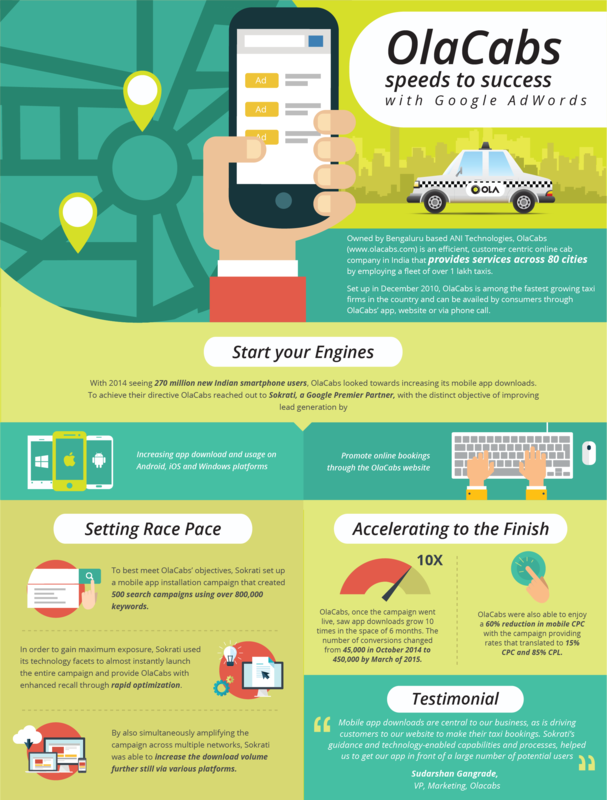 To match the speed of its expansion, location specific targeting within AdWords helped Ola to scale up its awareness by focusing their advertising in the cities they were launching in. To be specific in their reach, it utilized the demographic targeting feature to reach out to its prime target audience in the age groups of 20 to 50 years. By segregating its target audience by age, helped in focusing on each demographic individually, and to gauge their response and thereby improve or revise the targeting for maximum impact. Location and demographic targeting ensured that its ads were shown only to relevant and high intent users, which helped to achieve high campaign ROI and an optimal utilization of the marketing budget. A mobile first strategy has therefore been the key to the exponential growth we have witnessed. A mobile app helps to reach our service at the precise time a user requires it. Google AdWords helped us to get our app in front of a large number of potential users, while at the same time reducing the cost per download. Sokrati’s guidance, detail oriented approach and technology-enabled capabilities, complemented by their speed in launching the campaigns, helped to provide Ola with improved mind share and an exponential increase in downloads.